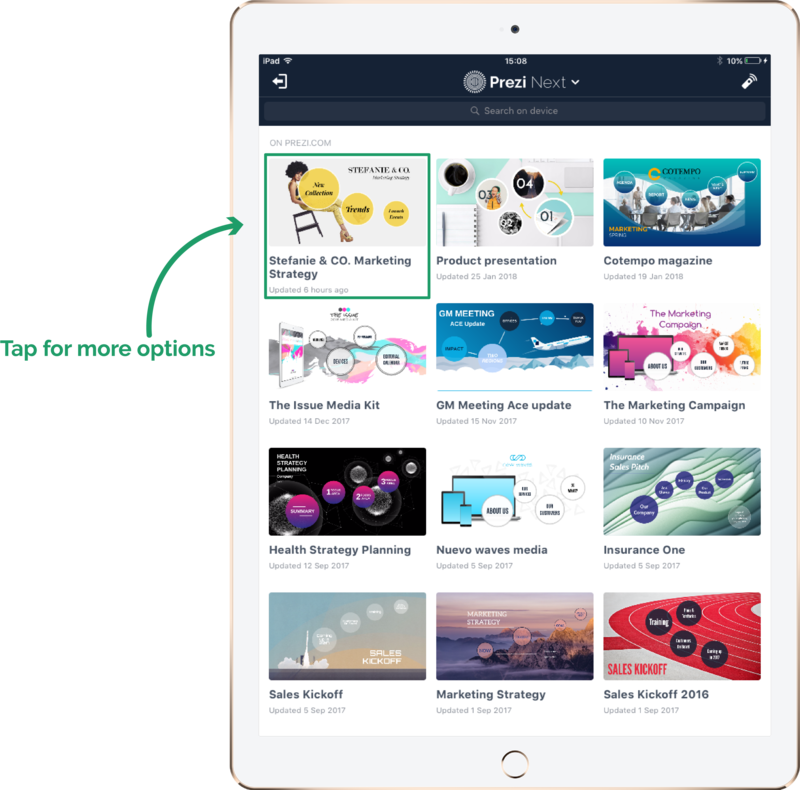 Want to have the presentation power of Prezi at your fingertips? 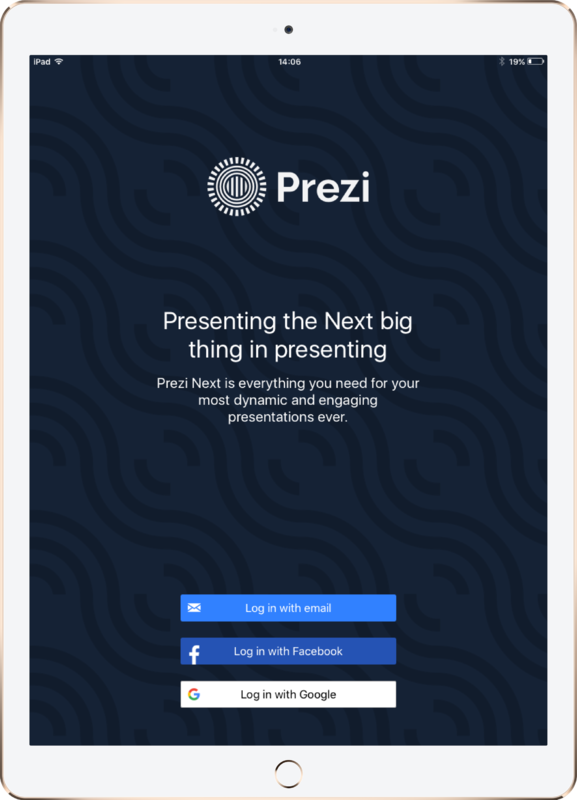 With the Prezi Viewer app for your mobile device, you can view, present, and share a presentation from anywhere in the world. 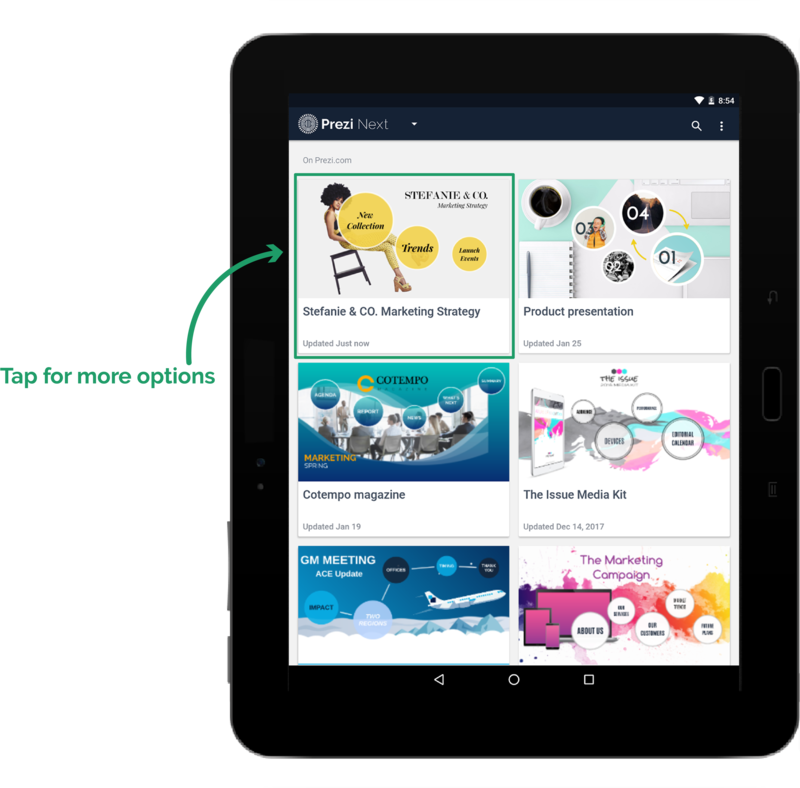 You can even view a Live Prezi presentation right on your phone or tablet. So, where will you take your audience? 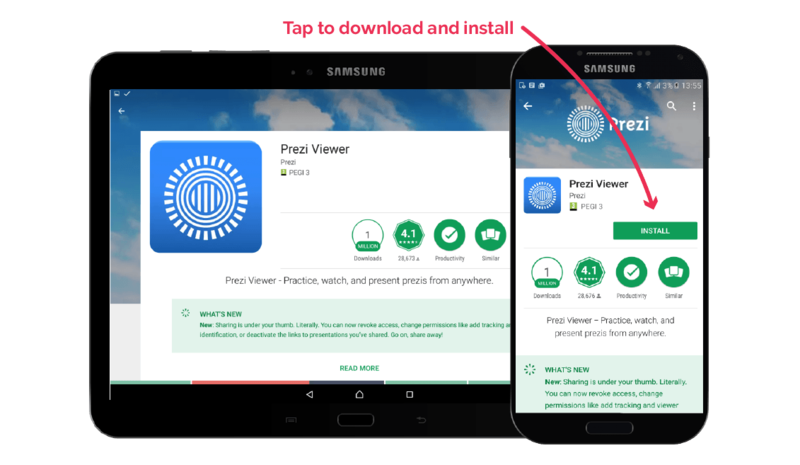 The Prezi Viewer app is available for Android and iOS devices. 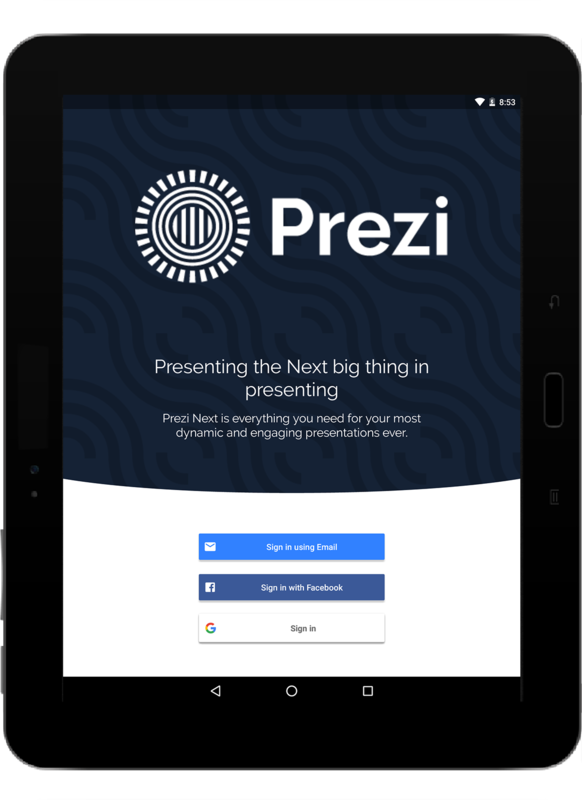 After you download and install the app on your mobile device, you can log in with your Prezi account. 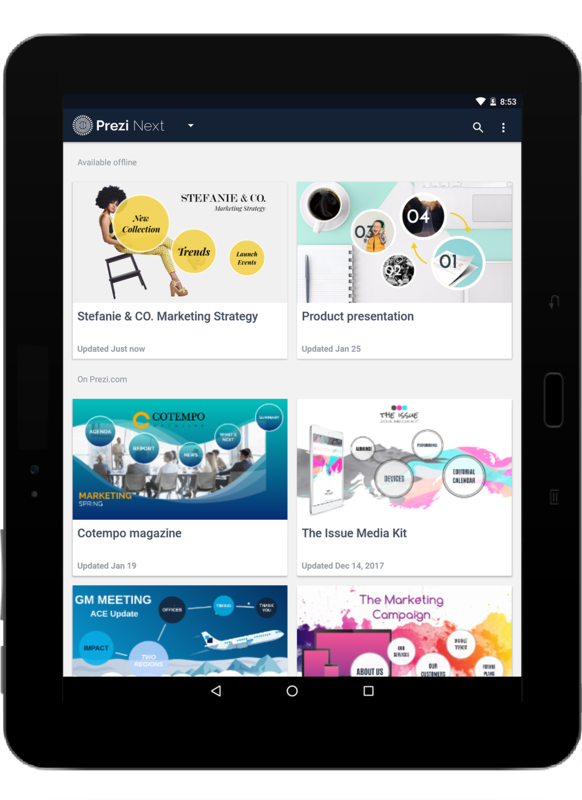 Note: Prezi Viewer is not currently supported on Windows mobile devices. Access the App Store from your iPhone or iPad. 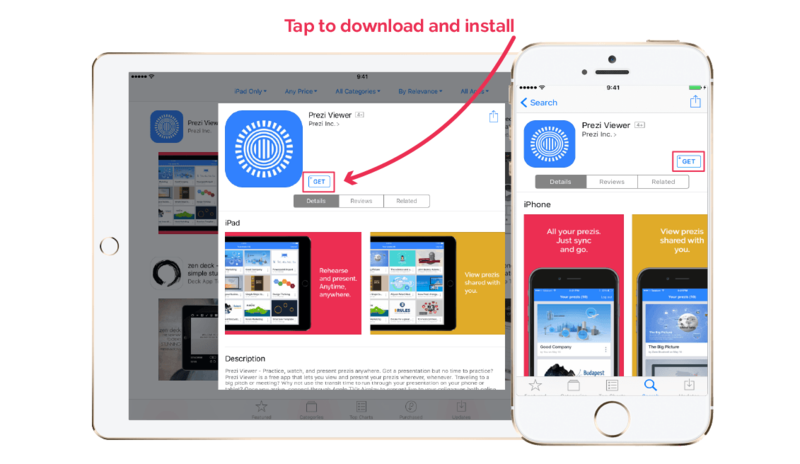 Search for “Prezi Viewer” or tap here. Open the Prezi Viewer app and log in to your Prezi account with your email address, Google, or Facebook. After logging in, you will see your Prezi dashboard. Access the Google Play Store from your Android device. 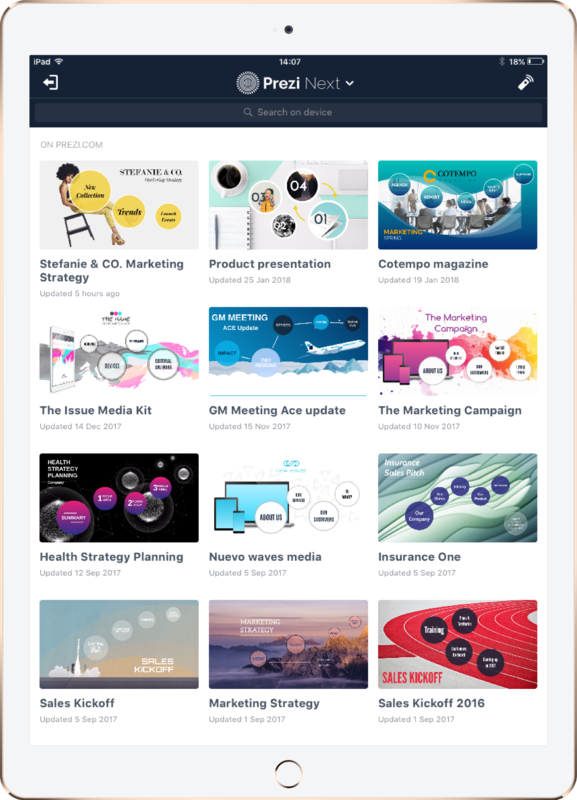 Your Prezi Viewer dashboard shows many of the same features as your dashboard in Prezi online and the Prezi desktop app. However, it looks a little different depending on what mobile device you use. Note: An Internet connection is required to log in to Prezi Viewer and to sync with your Prezi account. After you log in to Prezi Viewer, the dashboard syncs with your Prezi account to show your available presentations. From here, you can also search for a presentation or log out of Prezi Viewer. 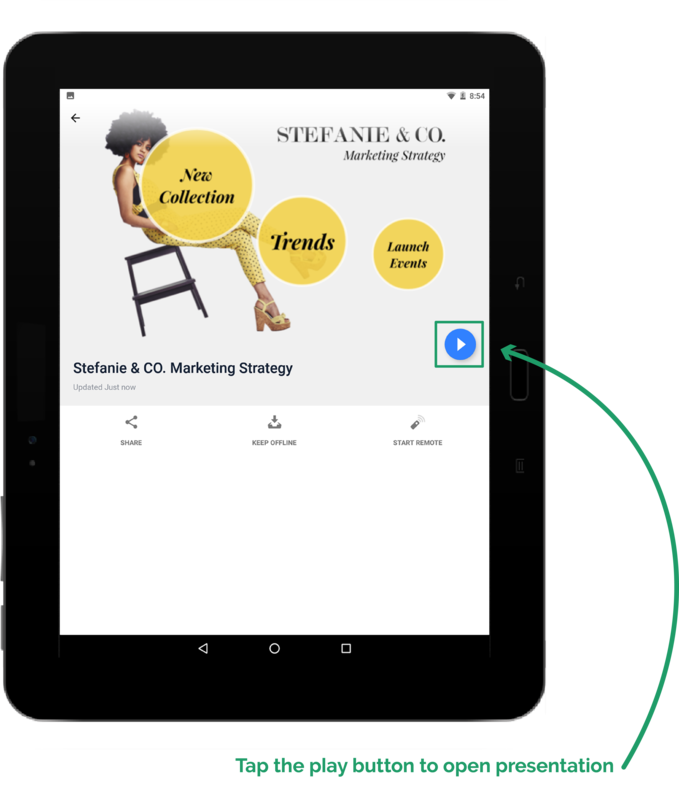 Tap on a presentation thumbnail to bring up more options. You can present or view a presentation anytime, anywhere, with Prezi Viewer. Note: Hold your phone or tablet in landscape (horizontal) orientation for full screen. You can also tap the the icon in the bottom right corner of your presentation to enter or exit full screen mode. From your dashboard, tap on a presentation for more options. Tap the Play button to open the presentation. 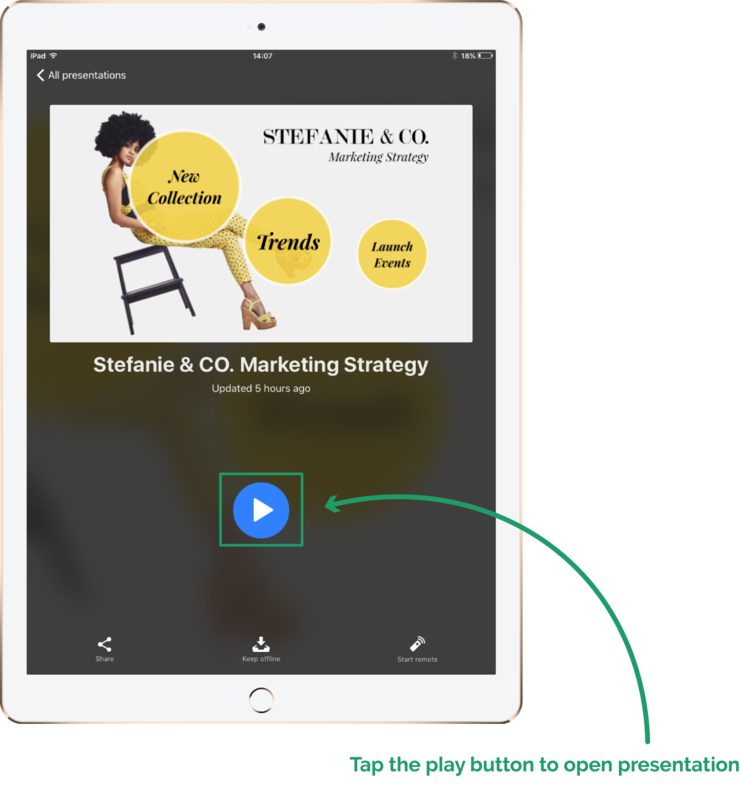 Navigate through your presentation using the arrows at the bottom of your screen, or by tapping on the right and left edges of your presentation. 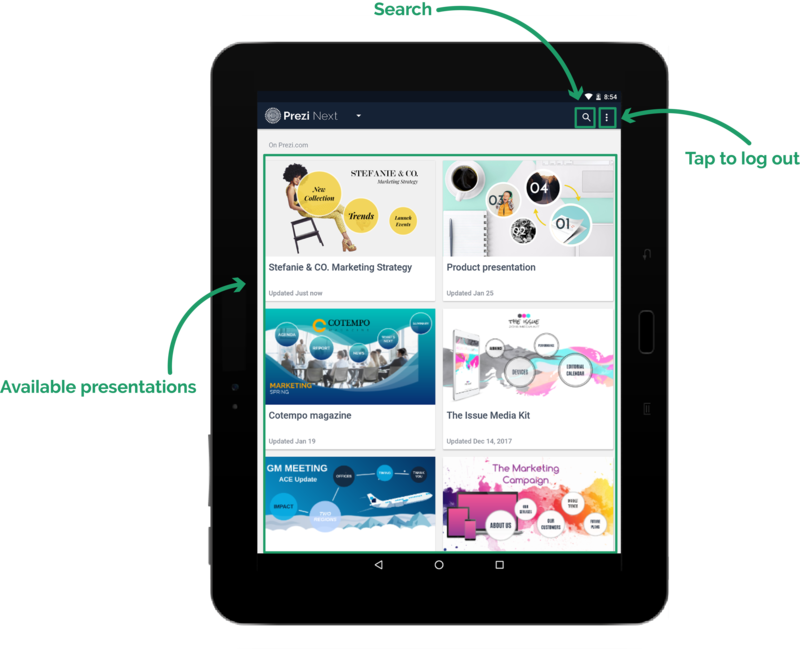 You can also tap directly on topics, subtopics, and objects to navigate freely within your presentation. 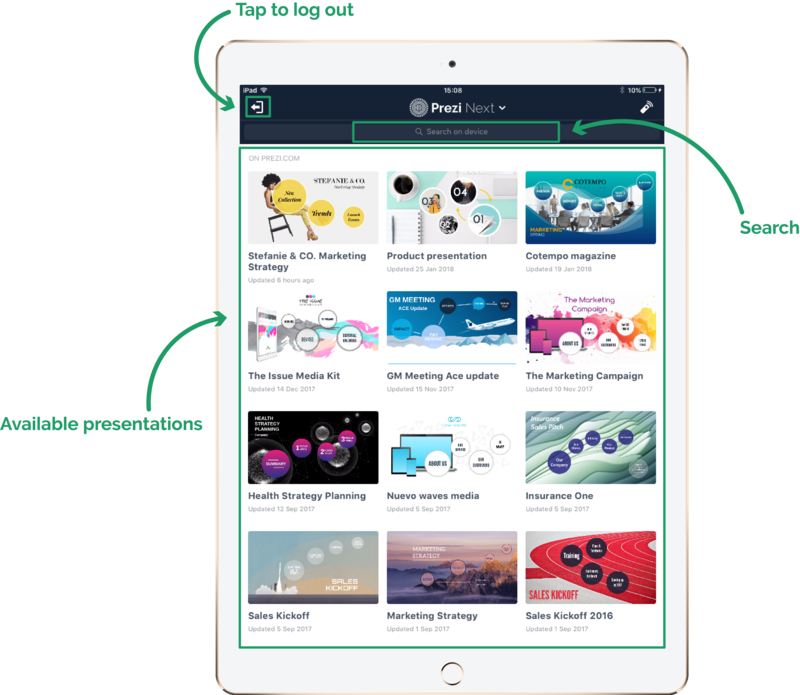 Now that you’re familiar with the basics of Prezi Viewer, learn all about keeping a presentation offline or find out how to use your mobile device as a presentation remote.